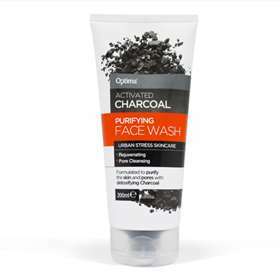 Optima Purifying Face Wash contains activated charcoal which has many skin care benefits. Activated charcoal detoxifies skin by drawing dirt and oil from facial pores making them less visible. Optima Activated Charcoal wash is also boosted by Aloe Vera juice and Cucumber Fruit to refresh and illuminate skin. An ideal addition to your skin care regime. Wet face and gently massage a small amount in to skin using circular motions taking time to focus on the T-Zone (forehead, nose and chin) which is generally oilier than the rest of the face. Aloe Barbadensis Leaf Juice, Aqua, Sodium, methyl Cocoyl Taurate, Cocamidpropyl Betaine, Sodium Methyl Oleoyl Taurate, Glycerin, Lauryl Glucoside, Sodium Chloride, Sodium Lauroyl Methyl Isethionate, Benzyl Alcahol, Parfum, Dipterocarpus Turbinatus Balsam Oil, Pogostemon Cablin (Patchouli) Oil, Trisodium Ethylenediamine Disuccinate, Charcoal Powder (Activated), Cucumis Savitus (Cucumber) Fruit Extract, Boswellia Carteri (Frankincense) Oil, Canarium, Luzonicum Gum (Elimi) Oil, Citrus Aurantium Dulcis (Orange) Fruit Extract, Cymbopogon Martini (Palmarosa) Oil, Eugenia Caryophyllus (Clove Leaf) Oil, Chamomilla Recutia (Matricaria) Flower Extract, Citrus Paradisi (grapefruit) Seed Extract, Echinacea Pupurea Extract, Polyglycerin-10, Polyglyceryl-10, Myristate, Polyglyceryl- 10 Stearate, Aniba Rosaeodora (Rosewood) Wood Oil, Bulnesia Sarmienti (Gualacum Wood) Extract, Cedrus Attantica (Cedarwood) Bark Oil, Cinnamomum Zeylanicum Leaf Oil, Citrus Aurantium Amara (Bitter Orange)Leaf/Twig Extract, Citrus Nobilis (Mandarin Orange) Peel Extract, Commiphora Myrrha (Myrrh) Oil, Pelargonium Graveolens Oil, Jasmine Officinale (Jasmine) Extract, Rosa Demascena Flower Oil, Styrax Benzoin (Benzoin) Extract, Citric Acid, Sodium Dehydroacetate, Sodium Benzoate, Potassium Sorbate, Citronellol, Eugenol, Limonene, Benzyl Benzoate, Linalool.